This Food on Friday is not about dishes that kids love. It's about dishes that kids can and will enjoy making themselves – maybe with a little adult help. So if you have posted about things that you think kids would like to make, please do link them in. It doesn't have to be a recent post. Just put your name and the name of the dish into the first Mr Linky box and paste the url for your post into the second one. I will be pinning the links to this Pinboard. I am looking forward to seeing what you come up with. It will give me good ideas for cooking with my nieces and nephews. Fun idea this week...thanks for hosting! The recipe for Anna Sultana's Bread and Butter Pudding is really easy, can use up a few slices of stale bread and is open to substitutions. My daughter learned how to make fried rice with greens and chicken at school, then came home and made it for the family. All I had to do was take the photos and blog about it! Hi Carole! This one is good because it uses convenience food and most kids just LOVE popping open those (US) biscuit tins. I believe you guys in NZ call cookies biscuits LOL I'm at a loss for what you call this concoction we make with flour & baking poweder,! Hi Carole, I hope this doesn't come up 2x because it asked me to log on AGAIN LOL...well, just delete one comment if it does. Anyhow, these are easy for young kids to make because of the convenience factor. And I never knew a kid who didn't love opening up that tin of (what we here in the US) call "biscuits"
Love this idea! Can't wait to see what awesome recipes will be posted! I had to really think about this one as I have no children. The recipe I submitted seems easy enough, I hope. I submitted a recipe that my (then) eight-year-old created! Having no kids of my own, I had to guess at this. I did one cookie and one blender-chocolate truffle recipe, figuring they would both be pretty easy and fun for kids to make. Butterscotch Walnut Brownies Like mother Used To Make Kids will love these and be licking the mixing bowl as i did as a kid ! Blueberry Pie, from a 10 year old boy!! Fun theme, Carole! Thanks for the round-up! Hi, Carole! I love, love this theme! Since my blog is specifically geared to healthy recipes that are quick, easy and family-friendly, many of our recipes can easily be made by kids (with some possible amount of adult help, depending on the kids' ages), and our foods are taste-tested by our own kids. So, this theme is absolutely right up my alley! I'm so excited about many of the recipes I see your other readers have added to the list! So many great ideas to explore! Thank you, as always, for this fabulous round-up! My recipe requires some adult supervision and isn't instant gratification, but leaning how to make your own soda pop is fun for old as well as young. Thanks. I've linked my Vegetable and Cheese Filo Triangles which my kids love to make... almost as much as they love to eat. Thanks again Carole. 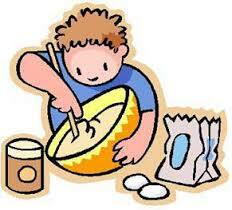 I added my kid's favorite years ago that they called "summer cookies" when mom said no we can't turn on the oven! Thanks for the invitation. My recipe needs adult supervision for sure, but I think it's something fun the whole family can get involved in. Have a great day!!! Very easy spinach and corn muffins - with the bonus of being healthy too! What a fantastic theme, never have enough recipe options when cooking with children ~ Thanks so much, Carole!! Mine are up! Thanks Carole! Hi Carole, Linked gluten free pancakes for kids to make on their own. hello i bought a fun sandwich that the kids love!love all the great food idea here! All these ideas look so fun and yummy! I posted my Easy Enchilada Tacos for One. Great idea for a link up. So many yummy ideas! Thanks for hosting. Hi Carole, I have just added my Cheese Straw recipe - my daughter loves making these - and they couldn't be easier. What a great Food On Friday! Love all of these recipes. Happy weekend, Carole. Love this topic! So important to get kids in the kitchen to develop a knowledge and love of food and cooking. So glad I could be included in this. I haven't stopped by for a while--can't wait to look around again! Such great ideas! I just added the link to a video demo for making homemade peanut butter. So easy that the kids can make it - no fillers and no preservatives. Of course I entered the name incorrectly... It should be LydiaF: Stuffed Dates...easy for kids to make with a little supervision. Thanks for inviting me to this party! Oops. I made a mistake and my links were added twice with different names. Sorry!